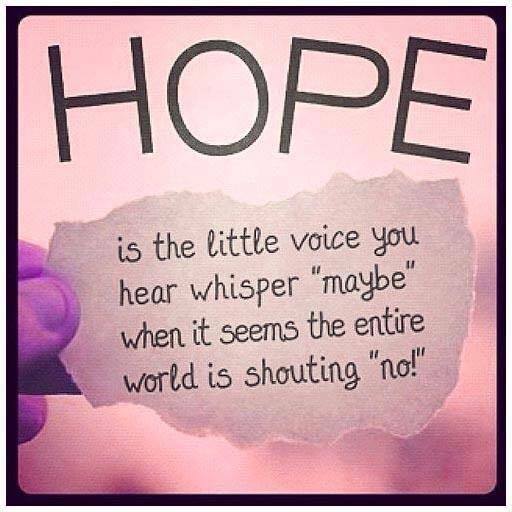 I remember when hope was prevalent in my life… but not in a good way. I used to HOPE that I would not get pulled over for drinking and driving. I used to HOPE that my family would not notice me sneaking in the bathroom to pull out my water bottle filled with vodka for a few sips during holiday gatherings. I used to HOPE that my employer would not notice my bloodshot eyes and the shaking going on in my body. I used to HOPE that no one would ever ask me to quit drinking. These days, HOPE looks quite a bit different. Today, I have hope that life will continue to get better… as long as I continue living in the solution. Regardless of the obstacles which almost inevitably come my way, I feel a sense of hope that God will get me through even the most challenging of times. Those times where the world seems to be setting up major roadblocks are the most challenging, but somewhere deep within, there is a tiny voice offering messages of hope. So for today, I prefer to live each moment with hope for the future, and gratitude for what I already have in my life.